Give Up Your Glasses for Good is a step by step self-healing course that teaches you how to improve your vision naturally. Heal your own eyes holistically with this comprehensive workbook that includes over fifty vision enhancing practices and dozens of eye charts and reading that can help decrease eyestrain and increase clarity. Sit back and relax as you watch your vision return to its original state; a state of equilibrium, ease, and auto-focus. Nathan T. Oxenfeld is a certified teacher of the Bates Method, Yoga, and Meditation. He skillfully blends these three together to form this dynamic and relevant course that helps people of all ages address the underlying root causes of vision problems instead of just treating the symptoms. Whether using this book as a way to prevent future vision problems or as a way to reverse current vision problems, healthier eyes will always be the result. Maintain healthy eyes and maintain the birthright of healthy vision for life. Nathan Oxenfeld is a certified teacher of the Bates Method and Yoga who gave up his glasses for good in 2013 after depending on them every day for 15 years. 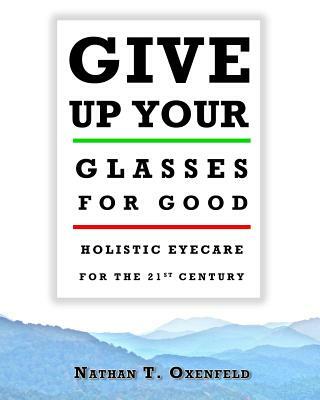 In his book, Give Up Your Glasses for Good: Holistic Eyecare for the 21st Century, he outlines the exact practices he used to relearn how to see clearly again without glasses, contacts, or surgery. He founded Integral Eyesight Improvement LLC in Asheville, North Carolina and has helped dozens of students improve their eyesight and insight. Visit www.integraleyesight.com for more information about his services.